About 6 weeks ago Georgia and I had a bit of a date, we did a bit of fabric shopping and then headed out for a hot chocolate. She'd been looking through my Ottobre magazines and picked out a pattern and asked me to make it for her. As the middle child she gets a lot of hand-me-downs and never complains so I was happy to make this for her. 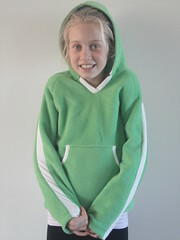 She chose the Hooded Sweater (spring 1/2005, design 30) and matched it up with some apple green polar fleece and white fleecy knit. I find the Ottobre patterns to be very generous in width, but not in length. I traced out size 134 with the length of size 146 and then added another inch. It could have used another couple of inches, but Georgia's really happy with it. It went together pretty nicely. The instructions are quite brief, and I had to think my way through the instructions for applying the white knit in the front V, but other than that it was pretty basic. 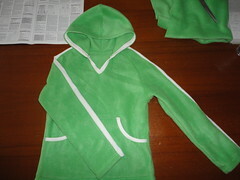 I'm not sure I'd use polar fleece for this pattern again, it made the bottom hem really bulky. I thought I'd add a hem band for a bit of extra length but it was just too thick. Our favourite bit? The white 'racing stripes' on the arms. I had a bad case of the blahs on Friday night. Paige had been sick with gastro all week, work had been exhausting and we'd had a big week socially as well. 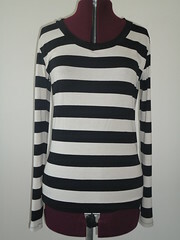 I just wanted to make something and who doesn't love a striped top. Enter Kwik Sew 3740. 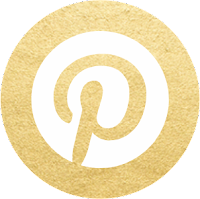 This is a great pattern, simple, quick and easy. I made view A in a medium, adding extra length in the body and the sleeves, but I left off the cowl - I think it would have looked a little busy with the thick stripes. 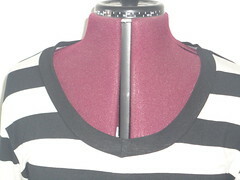 The pattern suggests you bind the neckline but I wanted a wider neck band. I should have used interfacing because it ended up being fairly floppy and I had to sew a small tuck at the centre front. It was a happy accident because I really like the slight v shape of the new neckline. Between the sewing and a glass (or two) of my favourite bubbly, I was feeling much better by the time I went to bed. I had some fun in my sewing room this morning. At the last minute a friend decided to throw her daughter a surprise birthday party so I had to come up with a gift pretty quick. Our local shopping centre is severely lacking in inspiration and I had no desire to leave the house so I decided to make her a skirt. She's a really girly, girl and so this fabric hit the spot. 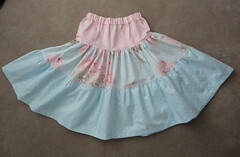 My girls don't wear this style of skirt any more and I can't get them into anything quite this sweet looking, so it was lovely to be able to use the fabric on someone who would appreciate it. Total winner. The birthday girl and her Mum both loved the skirt. 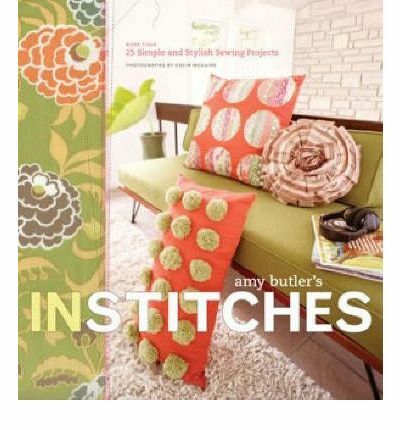 I'm signing on for Self-Stitched September. As difficult as I found Me Made June I do really enjoy the challenge and the inspiration from others. I know there has been some criticism around the project, but I think it's wonderful. 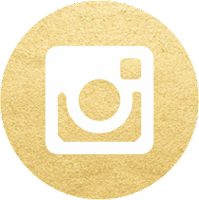 I'll try to keep my outfit posts to a minimum - you can always check out my Flickr photostream if you want to see what I've been wearing. I, Robyn, sign up as a participant of Self-Stitched-Sept '11. I endeavour to wear at least one me- made or refashioned item each day for the duration of September 2011. 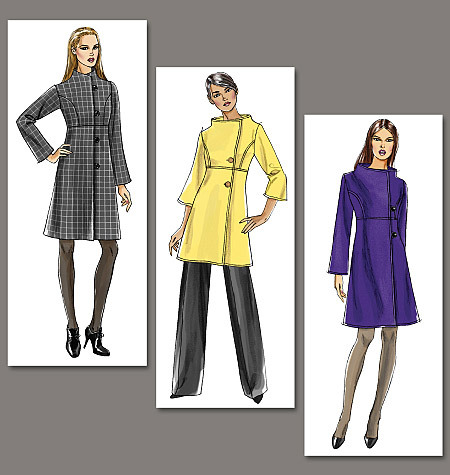 Not much happening on the coat front - but I'm going to get it done. It's too big to be left incomplete until next winter. Between a recent increase in hours at work and some beautiful weather my sewing has been sadly neglected. 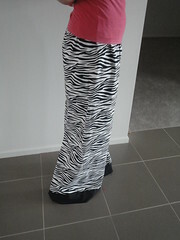 It has taken me a week to find the time to sew a pair of simple wide leg lounge pants. These are from Amy Butler's In Stitches book - I saw them on a blog (can't recall which one) and really loved the look of them. The pattern came on three separate pieces of paper (front leg, back leg, upper back leg) and only included the top portion, you add all the length yourself. I laid out all the pieces, pinned them together and then traced the pattern off as a single piece, there's even less sewing this way. These babies really are wide leg, the hem circumference is over 80cm! You can see that mine are a little bit too long - I didn't pre-wash my fabric so it's just a little insurance against shrinkage. I've also got the fashion fabric and interfacing for view B of V8548 cut out (on clearance for $5). It looks like it will be pretty simple to put together, but the recent unseasonal warm weather has turned my mind to spring/summer sewing. Hopefully I'll get my sewing groove back because there's so much I want to do.